Members of Clark’s A and B mock trial teams, photographed at the Cougar Classic: front, from left, Alex Gullotti ’21, Owen Mortner ’22, Emily Abbott ’21, Jordan Blocher ’21, Erin Swift ’22, Julie Reed ’21, Anabel Riggio ’22, Juliet Michaelsen ’19, Aaron Wolfson ’21; back, from left, Owen Ganter ’21, Aitana Doster ’20, Attorney Steven Kennedy ’88 (coach), Rachael Howe ’21, Alexandria Ross ’20, Sam Snediker ’22, Zoe Brammer ’21, Colleen Falconer ’22, Rachael Chen ’19, and Joanna Hamilton ’19. 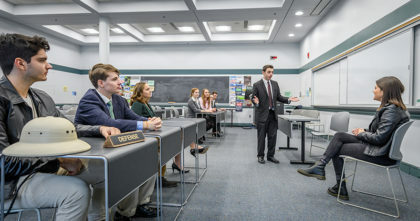 Clark University’s aspiring lawyers delivered victories at two recent mock trial tournaments. Rachel Chen ’19 questions a witness at the Cougar Classic. The Clark A team took first place with a 7-1 record at the University of New Hampshire Wildcat Invitational, held Oct. 27-28. Clark tied Suffolk University in one round and beat teams from the University of New Haven, Austin College of Texas, and MIT. Juliet Michaelsen ’19 won a Best Witness Award, and Rachael Chen ’19 won a Best Attorney Award with the highest possible score. The team includes Matthew O’Hara ’21, Owen Ganter ’21, Aitana Doster ’20, Salma Shawa ’19, Joanna Hamilton ’19, Julie Reed ’21, Alexandria Ross ’21, Zoe Brammer ’21, Chen, and Michaelsen. 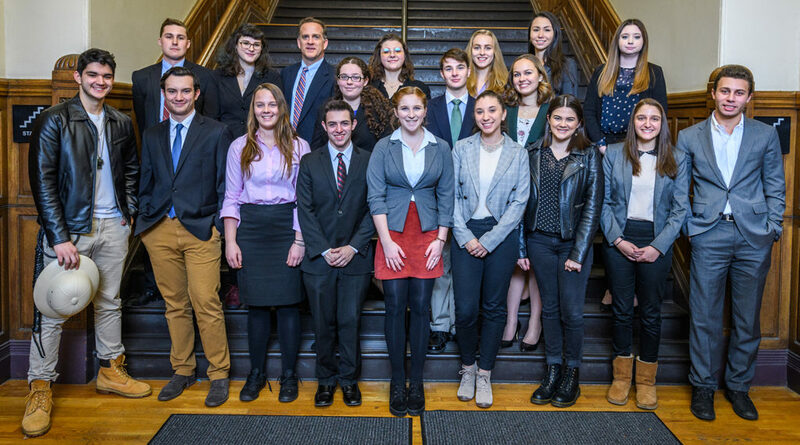 The novice Clark B team did not compete in the UNH tournament, but earned first place with a 7-1 record at the Cougar Classic Mock Trial Invitational Tournament held on the Clark campus, Nov. 17-18. Clark beat teams from Bryant University, the College of St. Rose in Albany, N.Y., and Colby College, and tied with UMass Lowell. Alex Gullotti ’21 and Rachel Goldman ’22 won Best Witness awards. Jordan Blocher ’21 practices his argument at the Cougar Classic. Team members included Colleen Falconer ’22, Emily Abbott ’21, Jordan Blocher ’21, Aaron Wolfson ’21, Erin Swift ’22, Rachael Howe ’21, Sam Snediker ’22, Anabel Riggio ’22, Owen Mortner ’22, Goldman, and Gullotti. Also at the Cougar Classic, Clark’s A team came in fifth with a record of 5-3, defeating The College of the Holy Cross and tying with teams from Colby College, UMass Lowell, and Wellesley College. Attorney Steven Kennedy ’88 coaches both teams.